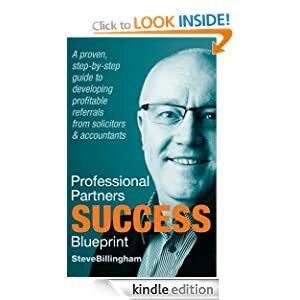 Partnership between Financial Planners and Accountants/Solicitors should be a marriage made in heaven, according to Steve Billingham, author of a new book titled Professional Partners Success Blueprint: a proven step by step guide to developing profitable referral from solicitors and accountants. But why is that not the case for many advisers and planners? In this AdviserHangout interview, I talked to Steve about his book (which I can’t recommend enough for advisers/planners) , the challenges that advisers face in working with accountants/solicitors and how to turn their professional partnership to a tireless referral engine. For planners/advisers who don’t have any professional connections with accountants and solicitors already, surely the fact is all the good ones are taken and there’s no point in even bothering? Well, Steve doesn’t think so. One interesting thing in the book is that solicitors and accountant are facing similar business challenges to financial planners, so how does working with advisers help them with these problems? What’s in it for them? What do they get out of working with planners? Money, you’ll find out ISN’T always the most important factor! Most adviser relationship with accountant/solicitor tend to be rather informal and the book suggest formalising this relationship with agreements drafted between the parties. What sorts of formal partnership structures ( e.g joint ventures) we seeing out there and which ones work best? Another area of challenge is having multiple partners – I have heard the term ‘professional promiscuity’ , where planners have multiple relationship with several local solicitors and accountants. First is this are worry for accountants and solicitors, and how do approach this? Steve shared specific examples of best tip to identify, approach and develop long-term relationships with other professionals.